Militarism, violence, and war are pervasive in pop culture and the entertainment industry. The mainstream news media largely refuse to critique skyrocketing military spending and the vast negative impacts of perpetual warfare. Join World BEYOND War for our next free webinar featuring experts on the strained relationship between militarism and the media. Militarism is the “elephant in the room,” says FAIR founder Jeff Cohen. Former TV pundit for MSNBC, CNN, and Fox, Jeff was fired for shedding light on the perils of U.S. interventionism and in particular, for opposing the invasion of Iraq on the air. Rose Dyson, President of Canadians Concerned About Violence in Entertainment, expresses concern about the culture of war that is perpetuated by TV, music, video games, and social media. Popular culture glamorizes the use of guns, normalizing violence and conflict. 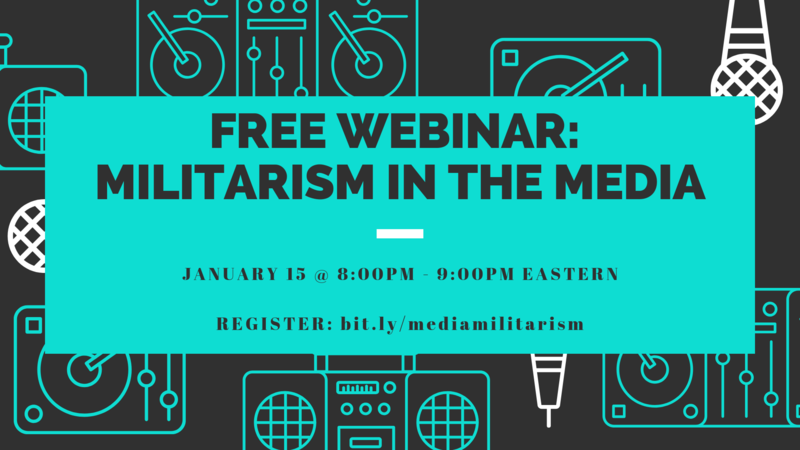 Tune in to our Militarism in the Media webinar with experts Rose Dyson and Jeff Cohen to discuss the role of media in promoting war and violence, and how, in turn, we can be peaceful advocates for a world BEYOND war. Click "Register" to sign up for the free webinar! The webinar will be hosted on Zoom. Participants can join via computer with an internet connection, or via telephone. Once you register, you will receive an email with the Zoom link and call-in information.